To combat high costs and excessive delays in the civil justice system, 1 rules of court and statutory enactments endow the court with extensive discretion to regulate the conduct of litigation. An overriding or overarching objective imposes on the court an obligation to supervise the pre-trial management of cases and to intervene in the conduct of a trial to promote efficiency and to contain costs. Powers of the court to achieve the overriding objective are extensive and discretionary. Their extent is such that they can affect access to the court. This prompts an examination of the basis of that discretion and its limit. The common law adversarial system, historically, is based on party prosecution. Pre-trial preparation and conduct of civil litigation was moulded to the nature of the trial process. At a trial the parties present the evidence and arguments. The court merely conducts the trial and gives judgment on the basis of the evidence and arguments the parties present. Denning L.J. described a trial judge's function in traditional terms in Jones v National Coal Board.2 The Court of Appeal upheld an appeal because the trial judge's interventions in examin';ttion in chief and cross-examination prevented the parties from properly presenting their respective cases. In Denning L.J. 's summation the judge must hear and determine the issues raised by the parties. Finding the truth and doing justice according to law is essential to the judge's function. Truth, his Lordship thought, is best discovered by "powerful statements on both sides of the question".3 A trial judge holds the balance without taking part in the disputation and thus avoids a clouded vision.4 The judge cannot call or examine witnesses lest it create an appearance of favouring one side or the other. The judge may question a witness only to resolve ambiguities or obscurities but cannot otherwise interrupt counsel, other than to see that they comply with their obligations to the court and the other parties. Any further intervention may cast the judge in the role of an advocate. Even though the parties have primary responsibility for conducting a civil case, the civil justice system is still a public resource. There is therefore a general public interest in its proper and effective use, which the court has an active responsibility to enforce. In Denning L.J. 's description the court's role might be characterised as passive. The overriding objective transposes the court's role to active. Justice and efficiency are fundamental features of the civil justice system. Civil litigation, in both its pre-trial and trial phases, must be conducted so as to conserve private and public resources and to contain cost and delay. Equally, the parties are entitled to due process. Rules of court underpin the court's role. The court has management responsibility beyond the specific needs of individual cases. Its responsibility extends to the fair and efficient allocation of public resources. Rules of court in most jurisdictions confer on the court discretionary powers to manage most aspects of the pre-trial preparation of civil litigation and to manage the conduct of the trial. Court directions given in pre-trial management substantially influence the conduct of a trial. The court may, in pre-trial directions, limit the time to be taken for the trial, determine the number of lay and expert witnesses to be called, limit the time the parties have to present their submissions, or give directions as to whether evidence is to be given orally, by affidavit or in some other way. More specific procedures may be prescribed in court practice directions. Throughout the proceeding the parties are subject to the discretionary control of the court. 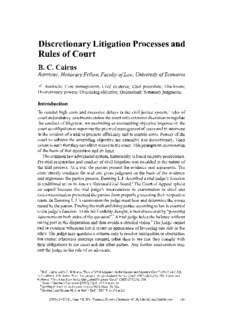 In the Australian jurisdictions, rules confer on the court broadly similar powers of management, including the overriding objective of justice and efficiency. The Uniform Civil Procedure Rules 1999 in Queensland may be taken as typical. They are sufficient to illustrate the general Australian civil litigation system.